Tampere Kaukajaervi, FINLAND. Women's Lightweight Pair. Centre Gold Medalist USA LW2- Christine SMITH - COLLINS, Ellen MINZNER. Left Silver medalist, GBR.LW2- Alison BROWNLESS , Jane HALL.Right Bronze Medalist. DEN LW2-. Kristine JOERGENSEN , Sharon THILGREEN, Awards Dock. 1995 World Rowing Championships - Lake Tampere. Photo by Peter Spurrier. If you didn’t know to look for it, you just might miss it. Buried in Rule 42 on page 29 of the FISA Rules of Rowing is a significant change. For the first time in history, rowers who race with a disability (para-rowers) will compete on race courses that are the same distance those of able-bodied rowers. This isn’t just a change of the race length, however. In Ellen Minzner’s view from her launch on the Charles River, she sees it as the beginning of equality for para-rowers. “A number of changes went through FISA this year,” Minzner, the coach of the U.S. Paralympic coxed four says as we talk on a warm summer afternoon. “The race distance is now 2,000 meters. That puts us on equitable terms with everyone else.” Minzner speaks quickly, with a spark that shows she is the perfect person to be the lead the U.S. Paralympic national team as it enters this new era of racing. Minzner, herself a two-time world champion in the lightweight women’s pair (1995 and 1996), has been here before. She likens the development she saw in women’s lightweight rowing during her own rowing career to the evolution and advancement that is currently happening in para-rowing. Competing as a lightweight rower on the international racing scene in the 1980s and ‘90s seasoned her for this chapter of her career. “I have the right mindset because I was a lightweight athlete when it was just coming into the Olympics. “I have the perspective of seeing how things on the lightweight women’s side played out over time,” Minzner says. Her elite rowing career led her through nearly 10 years of training and racing, earning her a spot on the U.S. national team five times and culminating in two world championships. Throughout her career, she learned the demands of lightweight rowing, both physically and institutionally. From a purely physical perspective, the equalizing factor of the weight restriction in lightweight rowing demands finesse, fitness, and technique. So, too, is it in para-rowing. Each crew is categorized by ability and matched to other crews with the same classification. Physical attributes that are seen as disabilities outside of rowing translate to qualifications as either a legs-trunk-and-arms rower (full-slide rowing in a mixed coxed four or mixed double); a truck-and-arms rower (fixed seat rowing in a mixed double); or an arms-and-shoulders rower (fixed seat rowing in a single). As the sport has grown, however, it has started to experience the same constraints that women’s lightweight rowing did 25 years ago. This is the institutional element of growth. From resistance from those who think there is merit in doing things the way they have always been done, to budget inequity among the national teams, and as para-rowers are now being offered opportunities in youth and collegiate rowing programs, a natural desire to row the fastest equipment, para-rowing’s success and inclusionary element is chipping away at these barriers. Minzner is, by virtue of being a lightweight rower, a small woman. Her athletic frame often has her huddled with her crew, her athletes towering over her. As is true of many smaller women, however, she holds her own without trouble. Minzner has been involved in coaching para-rowing since 1988, when she started with the adaptive rowers who were boating out of the Community Rowing, Inc. (CRI) boathouse on the Charles River. These were the years when she was training to make the national team and would pick up a coaching shift here and there to help fund her training. After her time on the national team, Minzner would continue her coaching at the collegiate level, working for the University of California, Berkeley as well as Kansas State University. When she returned to the East Coast, she joined the full-time staff at CRI as director of outreach. That positioned Minzner to do what comes naturally to her: build programs that reach as many people as possible and hook them into the benefits of rowing, whether in a recreational program, a rehabilitation program, or an elite training and racing program. This duality—knowing what it takes to develop a burgeoning genre of our sport and knowing the fabric that weaves athletic desire among crew members—is what positions Minzner perfectly for the precipice para-rowing currently seems to be perched on. Luckily for the sport, the leadership at CRI is putting the resources of one of the biggest and most successful non-profit rowing centers in the country into the development that Minzner is leading. Minzner takes a detour here, as she recounts the first selection camp she ran in 2013, and tells me about going to graduate school at Tufts University. Wanting to further her ability to have an impact on the communities in which she worked and lived, Minzner earned a master’s in sport and community development. This is the third piece of the puzzle, and the one that sets her apart from others who might bring excellent coaching experience to her role, but may not have the depth of knowledge she has about building community around sport and, specifically, around rowing. When CRI took on the Paralympic development and selection camps, Minzner became the coach for the boats that would represent the United States in the 2016 Paralympics. She runs the camps in what she calls an “old-school” model. “There are a lot of ways that developing a Paralympic training camp has to be different. It’s not so easy.” And here is where the knowledge Minzner has gained through her natural curiosity about adaptive rowing begins to shine through. “In the mixed four, the disabilities tend to be more along the lines of asymmetry. These things require attention as far as rigging goes. The level of individual attention for all the other things outside of rowing practice is big, and I don’t think it’s reasonable to ask an athlete in a wheelchair to relocate to a training center that isn’t ready for them.” There is something more than passion in Minzner’s voice here. As I listen to her, I realize it’s another quality, one that is seldom attributed to tough coaches trying to select the best set of athletes to go to the Games: compassion. Minzner has engaged her team of coaches and program volunteers to take a bold step and test a typical single with pontoons added. When her athletes saw the boats they were about to row, they asked what would happen if they flipped. “I told them I’d come get them,” Minzner says, as dryly as someone with her spirit can. The tests proved positive. The pontoons added the stability the athletes needed to be safe and the speed they could achieve was completely new for them. “When you see the smiles on their faces when they can move the boat 10 seconds faster per 500, it’s incredible.” Luckily for her athletes, and for all future para-rowers, Minzner is the United States representative on the FISA committee which is slated to study and recommend equipment changes for para-rowing. Minzner is the first to say that this kind of work cannot be done alone. Indeed, she’s engaged the skills of many CRI staff and volunteers. Jenny Sichel, CRI’s para-rowing coordinator and a two-time, silver-medal coxswain for the PR3 mixed coxed four, is often working with the boat technicians, trying to make the tweaks Ellen is hoping will give her athletes more speed, more control, and more success in competition. I ask Crumpholt if he sees the equipment evolving. “I have 12 simultaneous para projects going right now.” His voice tells me he’s the kind of engineer who likes a little chaos, the kind that drives innovation. “Here’s what I enjoy about CRI: we give every athlete the same chance. Everybody gets the best oars with the best hull. You can really extract the best out of the athletes. We have some really aggressive para-rowers, but the equipment itself needs to be right.” He chuckles a bit. “There’s lots to do, just not enough hours in the day,” he says, with an air that tells me he is unfazed by that particular limitation. It was that same sentiment that Minzner had originally expressed to Bruce Smith when he suggested she add the para-rowing development camp to her team’s work. Four years later, the lack of hours in a day hasn’t seemed to have a negative impact on her, her team, or the innovations they’re making. Video from the 2016 Princeton 3-Mile Chase at Lake Carnegie in Princeton, New Jersey. Shimano Rowing Dynamics rigs all your hard training to the best performance. 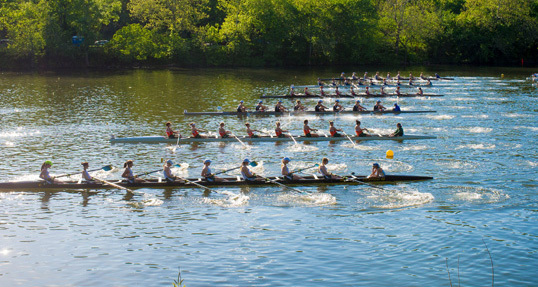 The Jefferson Dad Vail Regatta, now in its 80th year, is the largest collegiate regatta in North America, with over 100 colleges and Universities from the U.S. and Canada participating. May 10th and 11th, Philadelphia, Pennsylvania. © 2017 The Independent Rowing News, Inc. All rights reserved.